Looking for Last-Minute Hotel Deals in Glasgow? Call us for our latest deals! Searching for Last Minute Hotel Deals in Glasgow? Glasgow has come a long way in recent years and has a whole host of attractions for young and old, art lovers and nightclubbers alike. From the unmistakeable forms of the "Armadillo" at the SECC, to the sounds of the World Pipe Band Championships in August and the Glasgow International Jazz Festival in June, there is so much to discover and enjoy. If you have made a spur of the moment decision to take a few days out to visit the largest city in Scotland and discover its many facets, don't be forced in changing your plans for fear of not finding affordable hotel accommodation in Glasgow. There are a number of hotels offering last-minute deals. 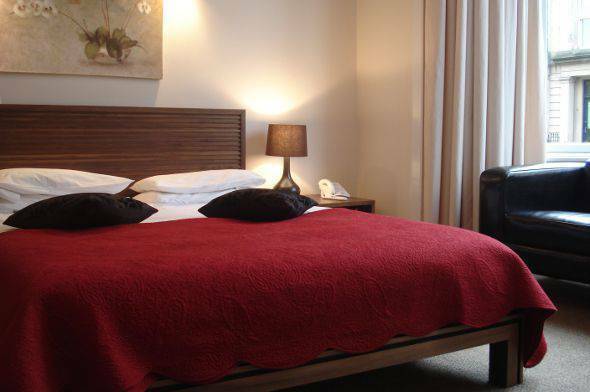 The Sandyford Hotel is a 3* hotel in a prime location. We are on Sauchiehall Street, just between the City Centre and the West End of Glasgow. We offer all of our guests a quality service and a real Scottish welcome. All 55 bedrooms are en suite and have tea and coffee-making facilities. There is also free Wi-Fi access from all rooms. We offer great value on B&B packages and a full Scottish breakfast is included in the bed and breakfast prices. Getting around Glasgow couldn't be easier when staying at The Sandyford Hotel. There is even a hop-on hop-off city sightseeing tour bus stop right outside the front door. We are within walking distance of many of Glasgow's attractions, such as the Kelvingrove Art Gallery and Museum and the O2 Arena. There is no shortage of nightlife in the area around the hotel and the district is synonymous with the best in Glasgow shopping, too. Hesitate no more. Call us today to discover the latest last minute hotel deals available now at The Sandyford Hotel. Our reception desk is staffed 24 hours a day to deal with last minute bookings and we are also delighted to discuss your other needs, be they group bookings, long-term bookings or late bookings. We can also be contacted through our website with the help of the online booking form. The Sandyford Hotel is a great family-run hotel with the best in last-minute hotel deals in Glasgow.